This cache is located near the Fordson/Red Robin Coal Company Buildings in Stone, KY, just off US 119, on KY 199. 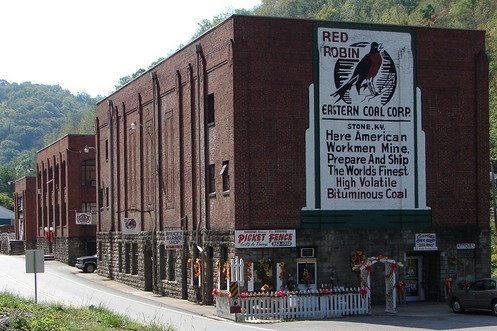 This historic three-building complex is located in Stone, KY - a town that exemplifies a once-thriving coal company town in Pike County and eastern Kentucky. 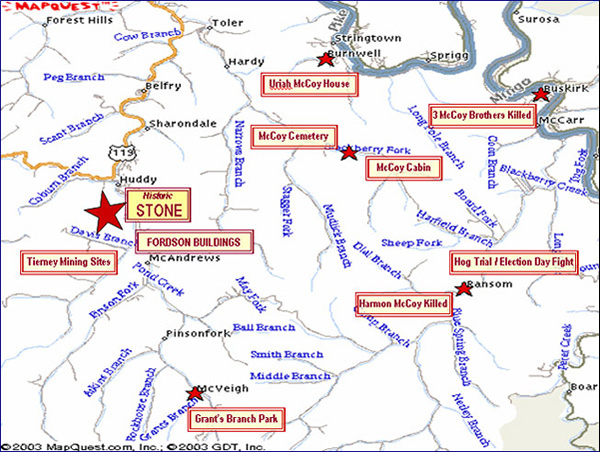 Pond Creek Mining Company established the community of Stone around 1910. It was named for the company's Chairman of the Board, Galen Stone, a leading Massachusetts businessman and partner in the prestigious Boston brokerage firm of Hayden, Stone and Company. In the early 20's, Henry Ford's search for a captive source of coal to feed his massive Rouge Steel Mills led to sale negotiations between Mr. Stone and Mr. Ford. At the time, one of Hayden and Stone's young brokers was Joseph P. Kennedy, father of President John F. Kennedy, and a protégé of Stone's. Through the masterful use of what would later become known as "insider trading", Kennedy bought shares of Pond Creek Mining stock on a ten-percent margin with borrowed money. With guidance from Mr. Stone, Kennedy sold the stock after the sale to Ford in December 1922, for a profit of $675,000 on an investment of $24,000. In today's dollars, that $675,000 would approximate $7 Million. 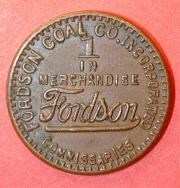 The coal company was renamed Fordson, the same name that appeared on Ford's popular farm tractors. Ford then went about the business of increasing production, community facilities and company houses, and constructing the three-building complex that was the hallmark of his coal mining empire. The Fordson Coal Company Store was located in the building to the far left that is now referred to as the "Store Building." There is now a museum and visitor's center that focuses on the history of the community and its beginnings as a coal camp. The "Office Building" in the middle housed the operation offices for the company and the company doctor's office also was located in this building. The "Theater Building" to the far right is the longest of the three buildings. The side of this building still shows the Eastern Coal Corporation banner. Contrary to popular belief, the central shop, warehouse, powerhouse, preparation plant, general manager's and club lawn homes for management personnel were built prior to Ford's arrival. However, Fordson did provide tennis courts and a three-hole pitch and putt golf course for the club lawn residents. Eight of the nine original homes are still occupied today which is testimony to the quality of labor and materials utilized in the construction of the community. At peak production over 8,000 coal miners were employed by Fordson and, besides company houses, Stone was home to a bank, boarding houses, two churches, clubhouse and small stores. The building complex consisted of the main office (where the accounting, administrative, engineering, managerial, medical, payroll and purchasing functions were located); the main company store (where the best in clothing, food, furniture and sundries were available); and the amusement building (which housed a drug store, library, restaurant, post office and theater where movies and stage plays were offered). 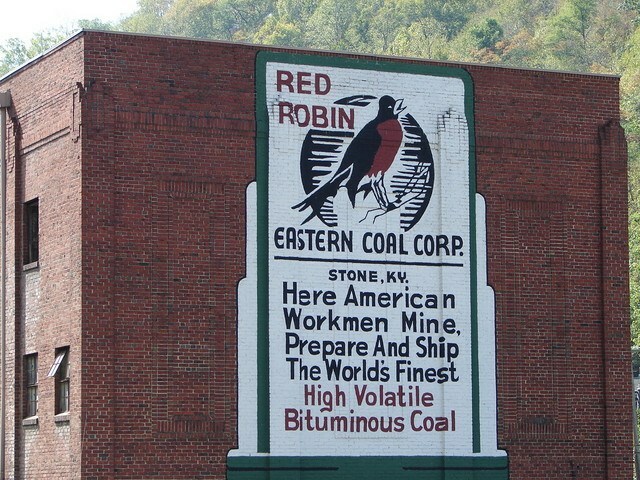 The Tierney Brothers purchased the facilities in 1936, changed the name to Eastern Coal Corporation and brought the now familiar Red Robin trademark and logo to the operation. In 1966, Pittston Coal Group bought the property and operated it until selling it to Massey Energy in 1993. Massey accessed the coal reserves from other locations, reclaimed the existing mining properties, sold the Stone Camp homes and abandoned the three buildings after numerous offers to donate them to the Pike County Fiscal Court were refused. Stone Heritage, Inc., is an outgrowth of a community-based, grassroots group initially started under the auspices and umbrella of the Pike County Judge-Executive's office in 1999. 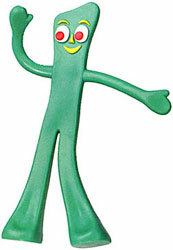 In a last ditch effort to save the buildings from the wrecker's ball, the group met periodically through March 2001 when it was unanimously agreed that the group would be best served by acting as an independent organization. In April 2001, Stone Heritage, Inc. was legally incorporated as a non-profit organization. By­laws were drafted and officers and a board of directors were then elected. 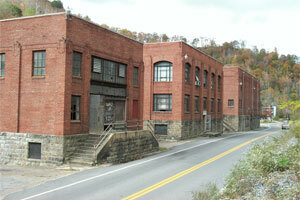 In June 2001, the Kentucky Heritage Council awarded a survey and planning grant for nomination of the three coal company buildings to the Historical Register. Approval of the nomination to the Historical Register was approved at the Council's Meeting in Erlanger on May 29, 2002. In mid-October 2001, the IRS approved an application for 501-(c)(3) tax-status and the Commonwealth of Kentucky and Pike County granted tax-exempt status shortly thereafter. On October 31, 2001, Stone Mining Company, a Massey subsidiary, gifted by deed the original three Fordson Coal Company buildings - a total of 10,700 square feet on 1.2 acres, valued at $133,000 - to Stone Heritage, Inc. 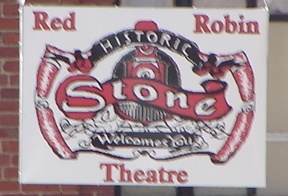 In January 2002, the Kentucky Heritage Council awarded an additional survey and planning grant for nomination of the community of Stone to the Historical Register. Work on the grant proved successful with the village of Stone being designated a historical District on September 19, 2003. Stone Heritage is working to preserve and renew the historic three-building complex. Currently, Stone Heritage has 600+ members who pay yearly dues to help support the group. Regular meetings consistently draw 30-50 people with guest speakers addressing topics of local interest to the community and to preservation efforts. FTF Congrats to The Beverly Hillcachers! !